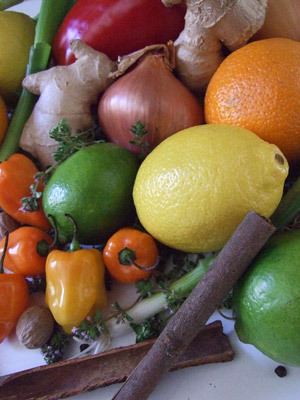 The cuisine of Jamaica shows its eclectic history through the spicy, complex flavors used to season the local ingredients. These distinctive flavors and recipes establish new flavor combinations that yield incredible results. This seasoning has been further refined to use different beer styles to accentuate different flavors of goat | lamb | venison in this version of a Jerk marinade. This recipe is different than the Jamaican Jerk Basic Marinade as this recipe is further refined for a specific protein being from goat | lamb | venison, to further enhance the flavors from the beer style and bring in other complimentary sensory elements. This recipe creates a unique flavor of the Jamaican Island, in a marinade that can be used for many types of protein and also used to season other dishes. 1 tablespoon allspice, whole, Jamaican from Savory Spice Co.
2 teaspoon paprika, sweet from Savory Spice Co.
1/2 teaspoon nutmeg, freshly grated from Savory Spice Co. In the pitcher of a blender or bowl of a food processor, add citrus zest and juice, garlic, Spanish onions, green onions, chili peppers (depending on your heat level, the seeds and ribs of the chilies can be removed to drop the heat and retain the flavor of the chilies | peppers), shallot, thyme, allspice, cumin, coriander, ginger, paprika, turmeric, nutmeg, salt, pepper, Scottish Ale, molasses and soy sauce | tamari | liquid aminos. Pulse the mixture a few times, breaking up the ingredients, scraping the sides down with a spatula. Then purée until mixture is smooth, creating a thick paste. Add more 1 - 2 more tablespoons of beer if the mixture is too dry and not mixing well. Taste the jerk before using, as the Scotch bonnet pepper is one of the hottest peppers (not the hottest) around and will make a spicy marinade. To use, coat the goat | lamb | venison liberally, rubbing the marinade into each nook and cranny. Give most proteins at least 4 hours and up to 48 hours of contact time with the marinade for optimum flavor, deep into the protein. 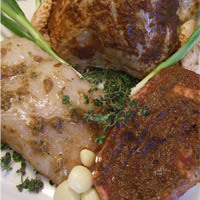 This marinade will last for two weeks refrigerated in a sealed container. 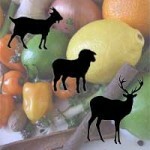 Traditionally jerk was cooked over Pimento wood, imparting its unique flavor to the goat | lamb | venison. Since this type of tree isn’t in everyone’s backyard, experiment with different woods. I like to use cherry, fig or Jack Daniel’s barrel wood cubes with goat | lamb | venison. Since venison is a very lean meat, be careful when cooking it, so it do not dry out. Start a small amount of coals, adding some cherry, fig or Jack Daniel’s barrel cubes (or chips soaked in water or beer for 30 minutes prior to use) atop, giving different flavors to the protein. Cook the goat | lamb | venison indirectly at first, letting the flavor of the wood envelop the meat for 30 - 45 minutes. Finish by placing the protein over the direct heat to sear the outside and form a crust. 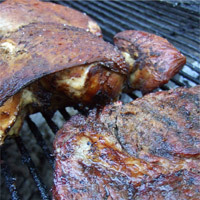 If using a larger piece of meat, low and slow will help the cooking and infuse a lot of flavor. Use restraint when adding cherry, fig or Jack Daniel’s barrel cubes | chunks, as the main flavorings should come from the jerk marinade, not just the wood. Cook at 250°F | 121°C - 300°F | 149°C for 4 - 6 hours, depending on the size, cut and type of meat being cooked. Traditionally this is the way jerk is cooked. Using several cinder blocks, create a pit 3 feet high, 3 to 4 feet wide and in length fire pit. Make your fire, using some charcoal and hard wood, covering the “pit” with either rebar or a heavy gauge wire. Cook as you would a grill, about an hour or longer for larger size meats. Preheat oven to 375˚F | 191°C - 400°F | 204°C. Place protein on top third of the oven and cook for 20 - 35 minutes to sear the goat | lamb | venison. Lower temp to 325°F | 163°C and finish until desired cooking temperature and doneness is reached. Goat | lamb | venison are medium rare between 135°F | 57°C -140°F | 60°C. With the strong and aggressive flavors from the curry and Jerk, try stronger beers that will stand up to the spices and chilies. Think IPA's, Double Reds, American Double | Imperial IPA or even unusual Herb | Spiced Beers. These will stand up to the intensity of the food, rather than be muted by it. Hops will add a nice bitterness that isn’t found in this style of food, adding more complexity to the pairing.